The idea of an adventure germinates in someone's mind often as a perfect antidote to boredom or a welcome escape from the monotony of life. But at times it can even happen for the sweet love of pigs; as it happened with Rob the Dude in our case. Now don't mistake Rob for a PETA activist or a member of 'Animal Rescue'; I was talking more in lines of the love for 'roasted pork'. So one Tuesday evening, back from a swim in the shark infested waters of his pond (I am not joking.. he got a pond with about 40 sharks, though I haven't seen it yet! ), Rob felt a tingling sensation in the upper left corner of his lower abdomen, exactly where the porko-adventure glands are situated. Unable to resist the over secretion of adventuralin, he sent out the following email to Jai, Sherwin and myself. It is worth pointing out that he was at his diplomatic best while writing the mail. Rob: Guys, Don't you think it is time for another trip to Tandiyandamol? If family obligations permit, the weekend around the 28th this month, which is a full moon night, would be perfect for overnight camping on top. I can meet you guys at Virajpet. Let me know if we can make this happen. 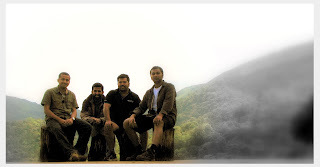 The memories of our last trip to Thadiyandamol, was still afresh in all our minds. The taste of green-apple vodka and roasted pork is not something sane people forget too soon anyway. Thadiyandamol is the tallest peak in Coorg, and the name when translated to Malayalam means "fat man's daughter". No..No.. honestly, it wasn't the thought of mounting the fat man's daughter that brought us there even the last time. It wasn't long before Jai responded. Jai: That sounds great...!!! I am in as long as Sherwin is joining...( as I need to baby sit my expectant wife with his !!!!). Also this time I am trying to get a cycle along. None of the exclamation marks were added or removed by me from Jai's mail. And I seriously do not want to correlate the three of them in the first part and the four of them towards the second part of the sentence, with the respective subjects mentioned and pass a judgment on what really excited Jai. Either way, what matters in the context of our story is the extend of excitement, not the cheap thrill you get by investigating the real cause of Jai's excitement - whether it is the destination or the prospect of a temporary escape from the wife or the bicycle. So I refrained from going all the way in that direction and mailed in my confirmation. After all, who am I to say no to such an enticing offer? Salted Pork, Rum... Yummm!! A little later in the day, Jai came online to demystify the whole cycle thing. Me: Jai, where are you planning to cycle around @ Thadiyandamol ? Jai: I am planning to get a mountain bike....primary agenda is to burn calories. Trying to see if I can pedal to Thadiyanmol. Me: waha.. great.. I would like to take some pictures while eating pork..as you would be busy pedaling. Jai: Hi Hi.. on the contrary, I will be pedaling.. reaching there first and eating the pork...while u guys will still be climbing. Me: Don't forget to get those water bottle fitted helmets ... we will fill 'em with some nice grape juice. Jai: Got a better idea; (http://www.decathlon.in/Cycling-Bags-ROCKRIDER-WATERBAG), get one of these and fill with single malt. Wow..its got a hose! Me: hose would be better.. straw won't do. Jai: hi.hi.....:-)..would be great to have all the jerks together! In spite all this activity, we all noticed that there was no news of Sherwin. In a desperate attempt to get a response from Sherwin, Rob sent out another mail, where he replaced the diplomacy with some much needed temptation. Rob: Alliyoo - so looks like yours is the last call to make. Imagine a full moon night. Tents. Campfire. Water. Food. Jaideep's cycle (all the way up there??? i donno) etc. etc. Will he say YES? Or, will he chicken out feigning exhaustion from test driving a Bugatti Veyron? Only time can answer this question! Dreams: they mean a thing or two?